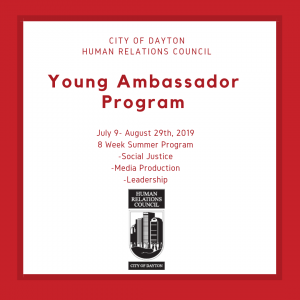 The City of Dayton Human Relations Council is launching its Young Ambassador Program for the summer of 2019! This program is designed for high school students who are interested in community engagement and social justice. Ambassadors represent the office of the Human Relations Council within the City of Dayton. Participants will build leadership skills, give back to the community in a creative way and make new friends. 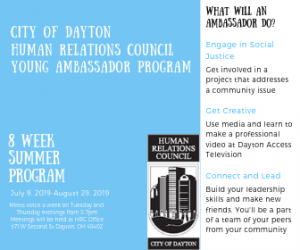 Ambassadors will learn to use professional media equipment and get creative with a media project to share their experience with family, friends and the Greater Dayton community. Ambassadors will meet twice a week for a course of 8 weeks. Meetings will be held Tuesday and Thursday evenings from 5pm to 7pm. Most meetings will be held at the HRC Office at 371 W Second Street. Some will be held at Dayton Access Television, where participants will engage in workshops to develop media skills. The first meeting will be held on Tuesday, July 9th and the last meeting will be held on Thursday, August 29th. Meetings are held every Tuesday and Thursday from 5pm-7pm. Ambassadors cannot miss more than two (2) meetings to complete the program. Q: Do I have to be a Dayton Public Schools student? The program is open to all students in the Montgomery County. Q: Are there any other eligibility requirements to apply? Students are required to have a 3.0 cumulative grade point average. If you are applying with less than a 3.0 cumulative grade point average, please write a short essay (250 to 500 words double spaced) as to why you wish to participate in the program. Q: Where can I submit the paper application? You can pick up a paper application and submit it at the Human Relations Council Office at 371 W Second St Dayton, OH 45402. Q: Is there a fee to participate in the program? There is a $25 fee to participate in the program. Contact Maya Smith-Custer at (937) 333-1413 or via email at maya.smith@daytonohio.gov with questions or for more information about the program.